You know that I've been reviewing books that deal with SuperDuos, Twins, and other shaped beads as they are published, but you also might have noticed that I don't use them very often myself. 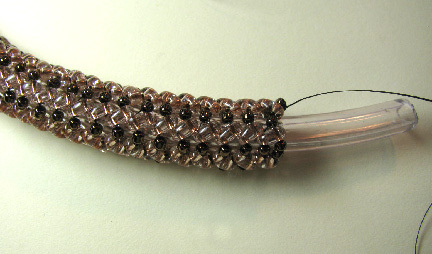 That's because I'm primarily a bead embroidery nut rather than a beadweaver, but that doesn't mean that I don't like to experiment from time to time. Also, the last few books published have given me some things to think about in terms of whether or not to work on adapting the stitches for the new shaped beads into bead embroidery stitches like I did for seed bead stitches in Bored By Back Stitch. Well, obviously, the first step is to play with them a little bit. 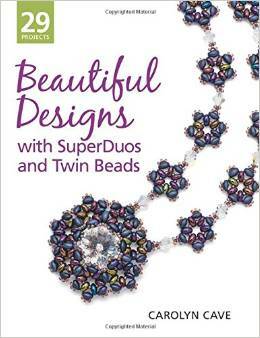 When I reviewed Carolyn Cave's new book, Beautiful Designs with SuperDuos and Twin Beads, I noted that I really liked one of the beaded ropes. A lot. 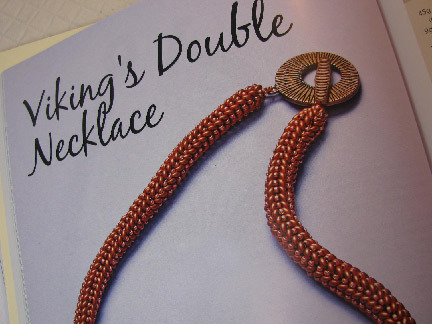 So that was as good a place as any to start, with Carolyn's Viking's Double necklace stitch. I liked it. I liked doing it. The rhythm quickly becomes second nature, and the rope progresses quickly. 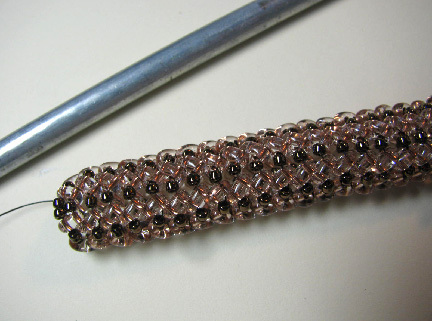 I really like the pattern that forms...you don't get anything quite like this with only seed beads. The rope is very soft, which can be good or bad, depending upon your preferences. I found an easy way to give it structure: just insert some vinyl tubing. I'm sure cords of various types would work well too! It's a lovely design, Cyndi. Will you remove the tubing before finishing it up? Yes, it's just a short length that I'm sliding along to help keep it firm while I work. But if I wanted it to be a bit more structured when finished, I could have used a longer length and left it in. Great tip on the tubing! Hmmm to leave the tube in or not? I could see how it would work well to give you structure as you weave, but yes, taking it out will make the finished piece lighter.